A fantastic choice for the garden, Pear Beth has white flowers followed by a reliable and heavy crop of eating/dessert pears in late August. The pale green pears have smooth, sweet, melting flesh. Not often found in the shops due to the irregularity of the shape and size of the pears, Beth is perfect for the garden. 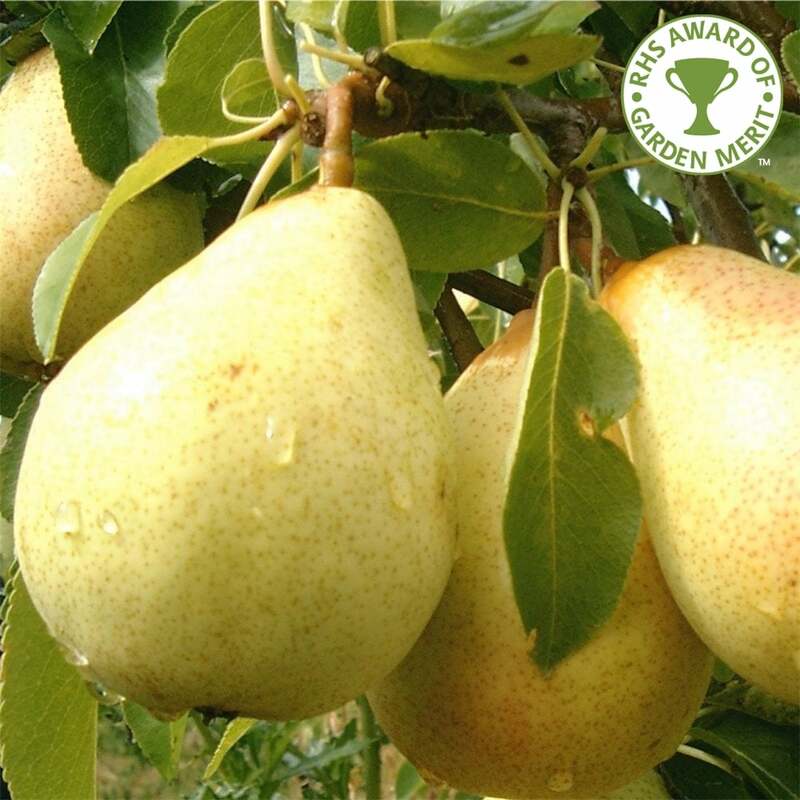 This English-bred variety of pear tree has received the RHS Award of Garden Merit and and is sure to impress. *Indication of the un-pruned height of this variety of pear tree on different rootstocks in 10 years. Variations will occur due planting position, pruning, geography etc. Beth requires a suitable pollination partner. Pear trees should be spaced according to their rootstock, for example a Quince A (semi-vigorous) rootstock will require approx. 3 metres between trees, whereas a Quince C (dwarf) rootstock will require approx. 2 metres between trees. Pot grown Beth Pear trees can be planted at any time of the year but bare root ones need to be planted between November and March. Remove weeds and grass within a metre of your desired planting hole then dig a hole slightly deeper than your root mass and approximately 3x as wide. To help pear trees establish more effectively, apply root grow. Then gently loosen the roots and place into the planting hole. Using 50% of the original soil and 50% compost, fill in the hole and firm around gently without banking soil up around the collar of the tree. We recommend planting pear trees using a stake and tie kit plus rabbit guard, unless you are cordon or espalier training them in which case they will need wire support systems. The Pear Tree Planting & Care guide has further information. If you’re planting in spring, summer or dry weather, water well and regularly for the first few months. If you’re planting in autumn, you may only need to water your tree a little. Keep an eye on young pear trees and adjust watering as required. To check if the soil requires further water, dig a finger down into the soil, a few centimetres, and if the soil feels even slightly moist, it does not need further watering. If it feels dry, water and repeat this test again. Keep the area free of competing weeds and grass for the first couple of growing seasons. It is important to prune your pear tree for the first few years after planting to ensure a healthy, balanced shape. Your tree should have one central leader and several strong side shoots. Straight after planting, remove the lowest laterals and prune the rest back to about 10-15cm in length. Carry out this type of formative pruning in early spring. In the following years, remove any shoots growing out of the trunk to maintain a clear stem. Also remove crossing, diseased or damaged branches. If your tree is looking overcrowded, remove some of the larger branches to open up the canopy. Carry out this type of pruning between November and March. 3-3.5 metres (10-11.5 feet) in 10 years - ideal for smaller orchards, individual specimens and espalier training. 2 metres (6.5 feet) in 10 years - ideal for smaller gardens as specimen trees and suited to cordon training.